Can We Limit Global Temperature Rise? February exceeded the 1.5°C target at 1.55°C, marking the first time the global average temperature has surpassed the sobering milestone in any month. March followed suit checking in at 1.5°C. January’s mark of 1.4°C, put the global average temperature change from early industrial levels for the first three months of 2016 at 1.48°C. Climate Central scientists and statisticians made these calculations based on an average of global temperature data reported by NASA and the National Oceanic and Atmospheric Administration (NOAA). But rather than using the baselines those agencies employ, Climate Central compared 2016’s temperature anomalies to an 1881-1910 average temperature baseline, the earliest date for which global temperature data are considered reliable. NASA reports global temperature change in reference to a 1951-1980 climate baseline, and NOAA reports the anomaly in reference to a 20th century average temperature. NASA’s data alone showed a February temperature anomaly of 1.63°C above early industrial levels with March at 1.54°C. Calculating a baseline closer to the pre-industrial era provides a useful measure of global temperature for policymakers and the public to better track how successful the world’s efforts are in keeping global warming below agreed-upon thresholds. The IPCC’s presentation of these scenarios was not designed to inform the discussion about warming limits (e.g., 1.5°C, 2°C goals of the Paris COP21 agreements). But the Panel does provide a way to make its projections of future warming consistent with discussions about targets. IPCC estimates, using the best and longest record available, show that the difference between the 1986-2005 global average temperature value used in most of the Panel’s projections, and pre-industrial global average temperature, is 0.61°C (0.55-0.67). Neglecting 0.61°C warming is not trivial, and makes a significant difference for the assessment of the goals established in Paris. In fact, 0.61°C amounts to about half the warming already experienced thus far. The dramatic global hot streak that kicked off 2016 doesn’t mean the world has already failed to meet the goals in the Paris agreement. Three months do not make a year, and it is unlikely that 2016 will exceed the 1881-1910 climate-normal by 1.5°C. 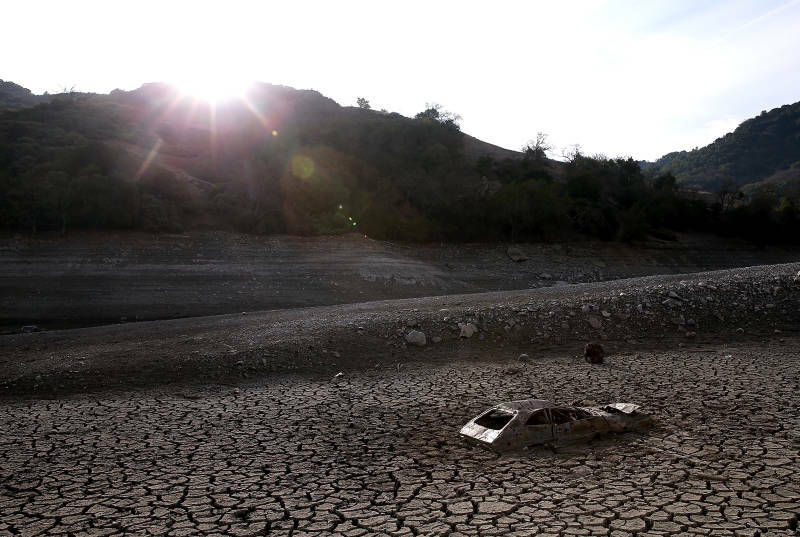 This year is also in the wake of a strong El Niño, when higher-than-average temperatures would be expected. And of course, exceeding the 1.5°C threshold for even an entire year would not mean that global temperatures had in fact risen to that point, never (at least within our lifetime) to drop back below it as it’s too short of a timeframe to make that determination. The NASA and NOAA monthly updates are presented as anomalies, or as the deviation from a baseline climate normal, calculated as an average of a 30-year reference period, or the 20th century average; they do not represent an absolute temperature increase from a specific date. NASA presents their results in reference to a 1951 to 1980 average temperature, NOAA in reference to a 20th century average temperature. 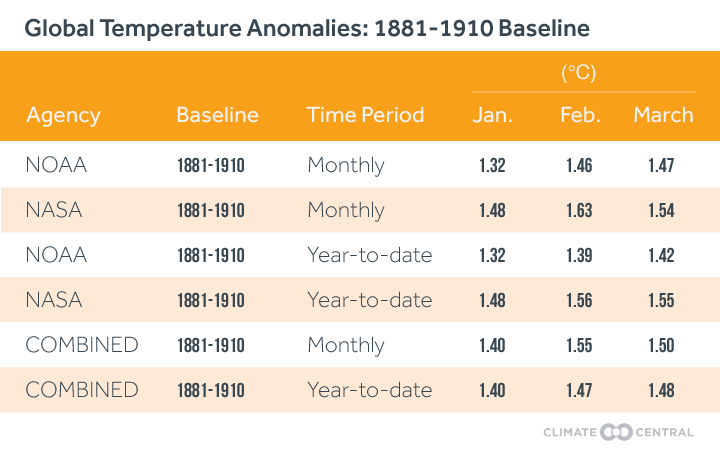 Climate Central used data from NASA and NOAA to create an 1881 to 1910 climate normal for the months of January, February, and March. We then compared the reported monthly 2016 anomaly for each of these months to this “early-industrial” baseline reference period. These anomalies were then averaged to produce a mean monthly NASA/NOAA anomaly for each month. The results are presented below. The NASA anomaly is considerably higher than the anomaly reported by NOAA. This reflects the fact the NASA’s calculations are tuned to account for temperature changes at the poles, where there are far fewer monitoring stations. NOAA relies only on historical station data and makes no adjustment to account for sparse records at the poles, where warming has been more rapid relative to non-polar regions.